During the holidays, many of us dream of a white Christmas--glistening trees, falling flakes, sleigh bells in the snow. In the midst of the songs, sales, and celebrations, we must not forget that the purpose of the manger was the cross. 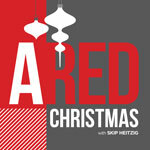 This series, anchored in Galatians 4:4-6, reminds us that the way to a spiritually white Christmas is Jesus' blood.